Keep your homemade bread fresh inside this beautiful bread box. The front of this bread box carries the inspirational message, "Give us this day our Daily Bread" as well as the wheat sheaf design. 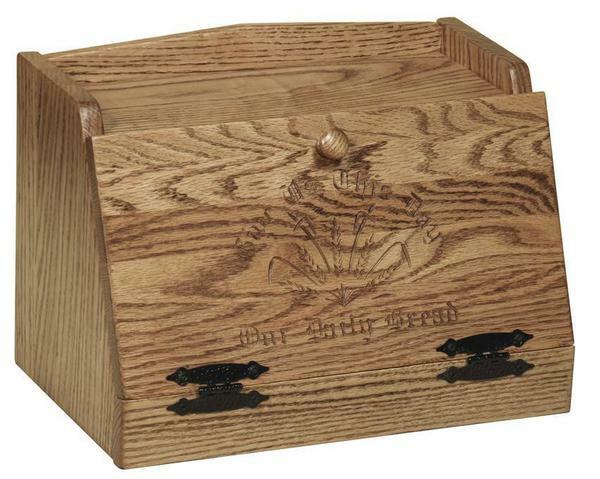 This hardwood breadbox will fit in well in a country kitchen. All sides are made from solid wood except the back, which is made of plywood in the same species as the rest of the box. For more information call one of our friendly sales associates at 866-272-6773 or visit our store located in Sarasota Florida. 15.5" x 10" x 11"